Nice photo taken near Murrumbeena Station as part of our works on the Caulfield to Dandenong: Level Crossing Removal Project. Our works there last week captured the attention of 3yo Eddy, who was passing by with mum and brother but stopped to watch our piling rig and excavator at work. Eddy became very chatty and during a break in works made radio calls to the idle plant operators, telling them he wants to become an excavator operator when he grows up. 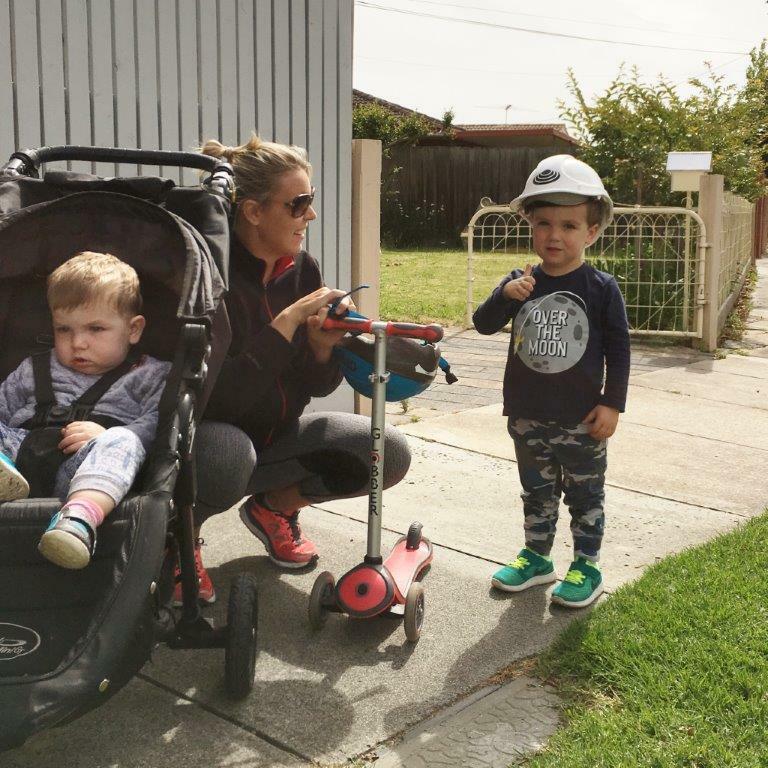 He was an instant hit with the Geotech workforce, most of whom have young families, so the guys gave him a hard hat with the promise of a hi-vis vest and safety glasses on his next visit. We look forward to seeing Eddy and family back soon. Thanks to Operator Dylan Davis for sending these images through from our Melbourne Quarter – Commercial Tower One project for Lendlease. They are on the back of events from last Friday, when the Liebherr LB28 rig reached depths of 32.5m drilling 1200mm diam. piles, a record for the Group. Belated congratulations to Geotech Civil's Matt Sentry, recently awarded the Young Professionals Best Paper at the ANCOLD (Australian National Committee On Large Dams Incorporated) 2016 Conference, held in Adelaide over 18-19 October. In October 2014, John Beever Australia (JBA) commenced Furnace Upgrade Works at the Qenos Olefins site in Altona. Qenos is Australia’s leading manufacturer and trader of world class polyethylene. The Altona site is home to three plants; Olefins, Plastics and Resins. Both Plastics and Resins plants manufacture High Density Polyethylene (HDPE), which is used in a wide range of markets including packaging, telecommunications and pipes for water conservation, irrigation, mining and energy. As part of the process involved, the two furnaces assist in the production of polyethylene from hydrocarbons. This complex project involves the replacement of coils and quench headers on the SCAL1 furnaces. Additional projects were combined within this complex project such as the installation of new platforms and piping and control valve sets. The first of the furnace refurbishments was completed in November 2014. This was a six-week shutdown of the furnace. In conjunction with Qenos personnel, JBA were responsible for managing all mechanical works including the removal of existing furnace coils, pipe modifications and installation of new piping, platforms and walkways. In adherence to the Project Management Plan that was developed by Qenos, a rigorous labour selection was undertaken to ensure that all subcontractors met the requirements and understood project specifications and site standards. Before commencing the works, JBA identified the aged condition of the existing coils as a potential OHS risk factor while handling. John Beever recommended that the redundant coils be transferred mid-air by crane and secured to a steel form for a safer tilting procedure. Another major challenge for the project team was the congested work space, a potential risk factor that was successfully managed with excellent communication and harmonious work scheduling. Michael Barsha has been stationed at the Qenos Altona Plant for the past three years and was appointed as the Project Supervisor/Coordinator for the Furnace Upgrade Works. A boilermaker/welder by trade, he has over 15 years experience with JBA and has a prior track record in similar works at the Qenos site. Of the current progress, Michael lists safety as one of the key achievements, “the first half of the project has been successfully executed and with no incidents to date”. “I believe this was achieved through a lot of pre-planning, good proactive thinking and organisation. Daily site safety walk throughs were completed for three weeks prior to the shutdown. "JBA and Qenos worked closely together throughout the upgrade works and Qenos provided ongoing support through the provision of gear and resources. "We have a great working relationship with Qenos. They put on a barbeque to show their appreciation for the safe execution of the project so far,” said Michael. JBA and Qenos have enjoyed a long working and collaborative history together. Since early 2000, JBA has been involved in a significant number of works and maintenance at the Qenos sites including piping fabrication and installation, pressure vessel repairs and installation, furnace upgrades and maintenance, fractionating tower shutdowns and platform repairs and installation. John Beever Australia is due to complete works at APA GasNet’s Winchelsea Gas Compressor Station. APA is Australia's largest transporter of natural gas, delivering approximately half of Australia's annual gas use through its infrastructure. The Winchelsea Compressor Station will improve efficiency and provide greater capacity for gas supply to Melbourne. The project scope involved the successful installation of a single Solar Taurus 60S/C-402 Gas Turbine Natural Gas Compressor Unit Skid, ancillary equipment and oil cleaning and Type B gas audit inspection was also included in the scope. Upon installation, the Winchelsea Station consists of a skid-mounted gas turbine driven compressor unit with associated equipment and utility areas that connect to the Iona Main Supply Gas Pipeline. The project will help maximise APA’s pipeline efficiency. Design, fabrication and installation of site buildings. The project team raised to the project challenges, mostly generated by tight deadlines and wet weather. The final tie into the main gas pipeline was conducted over a three-day isolation during which time, gas supply to Melbourne was diverted via a smaller pipeline. All major fabrication of the pipework was completed offsite at the John Beever fabrication and jobbing workshop in Sunshine. This ensured that the cutting of pipeline was exact to allow for the expansion and retraction commonly caused by fluctuating weather conditions. The initiative, driven by the John Beever project team, accelerated works by four weeks. John Beever Construction Manager, Jay Furniss, has been overseeing the assembly and installation of the compressor unit and associated pipework over the past six months. “We had to come up with alternative construction methodologies and new techniques to combat the challenges that arose during the project. “For example, we used a 3D Auto-plant Piping Model to fabricate 96% of pipework offsite, reducing over 100 field fit welds. We also took the initiative to lift the long pipeline lengths with an excavator arrangement rather than a standard method. “The dedication of the supervisors, personnel and subcontractors was unparalleled. Getting the job done within the set timeframe required them to work in some difficult conditions and it was all achieved with zero injuries, zero major non-compliance and zero improvement reports from ESV,” said Jay. The Winchelsea Gas Compressor Station is set to be commissioned and operating on time and on budget, achieving all project objectives. This includes client satisfaction, with APA recognising John Beever’s safety record with a Zero Hero Award. In January of 2014, John Beever Australia (JBA) was engaged by Veolia as the principal contractor for the installation of an Indirect Thermal Desorption Unit (ITDU). Located in Melbourne’s west, at Veolia’s Brooklyn Liquid Treatment Plant, the ITDU consists of a vacuum drying unit specialised in the treatment of industrial wastes, through the extraction and recovery of resources such as oils and solids for re-use and recycling. The Brooklyn Liquid Treatment plant specialises in chemical stabilisation of Prescribed Industrial Waste (PIW). The facility currently accepts approximately 45 million litres of liquid, solid and packaged waste annually, producing around 15,000 to 20,000 tonnes of solid PIW. The installation of the ITDU will result in the diversion of this PIW from landfill to beneficial reuse. Site Interfaces – Design and Installation. This included the demolition of an existing building followed by the earthworks, preparation, supply and erection of the new ITDU building and West Sludge Shed Extension. The installation required an upgrade of the existing site infrastructure, including the Jemena HV Substation upgrade and the supply of HV cabling to the new plant. The site upgrades had minimal impact on the ongoing daily operations through efficient scheduling and overnight works to reduce any interference. JBA was faced with the complex task of installing the ITDU, the first of its kind for Veolia. The pre-fabricated plant, supplied by econ Industries in Germany, arrived in 45 individual containers. The installation involved a 14 week turnaround that required the transportation, unpacking and assembly of the plant. Some of this was undertaken at the JBA workshops due to weather conditions. Project Manager for the ITDU Installation, Julia McCarthy, was elated by the success of the project. “The project has gone according to plan, the client is happy and I had a great team that worked well together. “Assembling the bunkers and conveyors offsite within the JBA workshops not only helped to speed up the process but it effectively managed the OHS risk factors associated with welding in wet and windy conditions on site. “It’s great to see the project advancing from the civil works into the commissioning and testing phase of the project,” Julia said. The ITDU Installation met all project deliverables and will be completed on time by January 2015. Provisional on-going maintenance is expected to be awarded to JBA, a result of client engagement and satisfaction. This project was made possible through the support of the Haz Waste Fund. Thanks to Project Engineer Nik Kupres for sending this through. Below are some photos of Campaspe River Bridge, part of the Bendigo Train Line shutdown works. This was the second bridge to be waterproofed. It is 67m long, the second longest bridge Coleman Rail is doing during the October shutdown.